Latin America offers one of the best options for nearshore outsourcing for the USA and Canada. It also offers great resources for Spanish localization projects getting increasing important in the states. Latin America offers a large spectrum of options roughly corresponding to the countries in the region covering almost entire alphabet from Argentina to Venezuela. Each country has its own specifics and its own set of Pros and Cons; the differences between countries could be dramatic, compare for example political climate in Mexico and Venezuela. There are still enough commonalities to considering covering of Pros and Cons for the entire region. Infrastructure. The quality of infrastructure varies greatly from country to country but it’s quickly catching up to the required standards across the region. In countries leading of LA outsourcing – Argentina, Brazil and Mexico the infrastructure is likely to meet or even exceed your expectations, but even in countries far behind the quality is still acceptable. I was surprised how solid the infrastructure was in Chile or some cities in Bolivia. One thing is extremely important – the high quality infrastructure could be found mainly and sometime only in industrial areas of these countries. It is not at all as pervasive as it is in the USA. You must validate infrastructure sufficiency before moving forward with the vendor. The simplest way to do it at superficial level is to request a video interview over Skype. Skills Availability. Skill availability for high tech occupations depends on specific country / city. In general it could be characterized as medium to low. Generally you can build a small team of Java or .NET developers in somewhat reasonable timeframe, but size of the talent pool is microscopic when compared with India and China. The quality of the pool helps to some degree make up for its size, but only to some degree. In my experience putting together an 8 member team of high quality Java developers / QA engineers took over 4 months. I have to say that my quality requirements were very high and I was looking for somewhat unusual set of specifics. When you are after more run of the mill skill set you probably would have easier time. Legacy technology skills and enterprise applications skills are even less common. English Skills. Not as good as you’d expect… and why would you even expect? I worked with many countries in the region and in each of them I met engineers who spoke English better than I, but in general you have to be prepared for language barriers or for substantially impaired hiring if you make fluent language skills a mandatory requirement. Written communications appear to be in better shape across the board; however, they still cause a drop in productivity for many of the team members. Developers on LA teams took very long time before they could to offer their opinion or disagree with USA team members. Facts and technical quality of solutions carried less weight with LA team when it came to conflict with personnel influence. For example a less efficient solution was accepted just because it had a lot of hours invested by the team members. To appease someone / protect their feelings was enough of a motivation in making core technical decisions. A very high emphasis on theory and academic values versus pragmatic business decisions. Take a look at Cross-Cultural Communication Between Latin American and U.S. Managers for a good list of the most significant differences. Rates. LA offers great variety of rates that depends on the country from relatively high in Argentina and Brazil to moderate in Chile, Bolivia, and Uruguay. While the rates by themselves tend to be on a high side they are fairly attractive when taken into consideration with “the entire package” that includes short / no time difference. Resource Turnover. LA countries offer better turnover rates than many of other regions. At the same time turnover on some of my / my friends’ projects outsourced to LA showed fairly high ratio. That seemed to be related more to a specific company rather than the region. Resource Quality / Technical Capability. Quality of resources varies greatly from a country to country, from a city to city, and specifically from a provider to provider. However, in general technical capabilities of the resources are quite impressive / above average. I was able to find people with in-depth understanding of cutting edge technologies and with proven experience of working with fairly recent methodologies in many countries across the region. There is also no shortage of resources when it comes to mainstream skills such as Java / .NET / C/C++. Legacy technology skills and enterprise applications skills are less common though. Of course one of the most significant Pros of the region it’s nearshore advantage, mostly linked to little / no time difference. The impact of it is difficult to overestimate – small time difference, similar holiday structure and bridgeable language differences makes working with teams in LA a great experience. 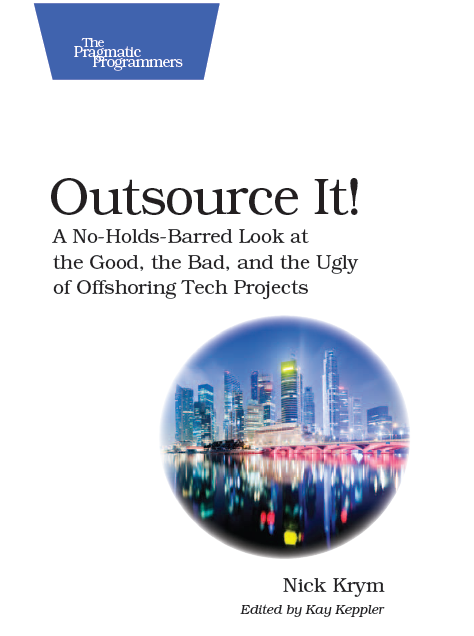 If you listen to an offshore vendor you will quickly learn the top 10 or 1000 tasks you should outsource. The chances are anything and everything that you do will be on that list. And that would be the list of things the vendor wants you to outsource. Take a look for example at Top 100 Projects You Can Outsource. The real question is about what is good for you, and of course it depends on your specific needs and challenges. My first outsourcing item does not currently land itself well in offshore model so I did not include it in top 10 – Data Center / Hosting. That covers hardware / networking equipment / etc. for range of systems – production, staging, development, etc. environments. The “degree” of outsourcing may vary greatly and depends on the maturity of your staff, you demand dynamics, etc. You may only take the space, bandwidth and power; expand it to fully managed infrastructure or even consider grids such as Amazon elastic cloud. Taking a viewpoint of a midsized software developments company here are 10 items I found to be on the top of list of tasks to outsource in technology. 1. Security / Availability Monitoring. In my experience I found that achieving aggressive service level benchmarks while maintaining high level security and privacy is practically impossible for a small or midsized company without use of Managed Security Monitoring. The scope of outsourcing may vary greatly depending on your needs. In my current place I outsource security monitoring and use third parties for security testing including ethical hacking. 2. Database Administration. I found outsourcing of DBA tasks, in particular related to supporting uptime of critical systems, extremely cost effective. Currently I use third party to monitor my production databases on 24×7 basis and use consulting from the same vendor on tough DBA design tasks. 3. Black Box Testing. I found that outsourcing some of QA tasks, in particular Black Box testing gives me great flexibility and has good price performance. In my view the key is to outsource appropriate portion of testing leaving sufficient portion in-house for acceptance, cross checking, knowledge retention and many other key elements of the development process. 4. Usability Testing. In my view Usability Testing is a perfect task to outsource due to many reasons with most important being an independent / objective feedback which is difficult to achieve with captive resources, other reasons include lack of in-house expertise and high cost of tools and infrastructure. 5. Graphical Arts, Writing and other Creative tasks. Assuming that Creative tasks are not the core of your business you may find outsourcing of it to offer dramatic price performance. With huge supply of freelance and offshore talent you can find high quality resources at a fraction of the price of high end firms and even in-house resources. 6. Tech Support. If you have to support your products the front line of Tech Support is one of the areas that can greatly benefit from outsourcing. Of course you have to be very careful in outsourcing any customer facing activities, and tech support is one of those arrears that got particular strong negative rap. 7. SEO. Search Engine Optimization could be quit laborious and requires in-depth knowledge of the techniques, latest trends, and subtle differences. Some offshore shops specializing on SEO offer performance based approach to compensation. 8. Software Maintenance and Sustenance. I found outsourcing of those “less glorious” tasks relatively meaningful, especially when I had a large legacy product to support. One of the value add items in outsourcing of maintenance task is potential morale boost for the local team. A word of caution here – as outsourcing of these tasks only pays off in a long run. 9. Reporting. Developing of a large variety of reports for internal and external clients often could become a considerable burden on technology team. Using offshore resources to produce and support custom reports in experience paid off quite well in many cases. 10. Technology Migration. Migration tasks could be perfect candidates for outsourcing, for example moving your database from MS SQL to Oracle, an app server from WebSphere to JBOSS, or migrating code from VB to VB .NET. The word of caution – some migration tasks could be IQ-demanding heavy lifting and require a lot of in-house efforts before they could be moved offshore. I said earlier that these 10 items are on the top of my list. Well, in many cases they formed the list in its entirety. You may consider outsourcing all these items before you move on onto more challenging and riskier outsourcing tasks.